Days before Canada's immigration minister said he doesn't see another surge of asylum seekers on the horizon, Kangni Kouevi became the third asylum seeker to suffer serious frostbite trudging north into Manitoba through snow and blistering cold. "It can kill you," the 36-year-old from West Africa, hands wrapped in thick bandages, said Wednesday of the harsh winter conditions he experienced crossing the U.S.-Canada border on foot in search of refuge last week. This comes as Canada's federal government is conducting a campaign south of the border aimed at discouraging asylum seekers from undertaking irregular crossings, and amid concerns about a potential new wave of Salvadoran asylum seekers coming from the U.S.
Kouevi said he left Togo, his home country, late in 2014 after his family disowned him for converting to Christianity. He says his father was a faith healer who threatened to have him killed for rejecting those traditions. That set off a journey that wound through South America and into the U.S. It culminated on Friday in a $700 car ride from someone Kouevi says he didn't know, who drove him from Minnesota to the northern edge of North Dakota. His hands froze and hardened after wandering in the cold for hours that night, when temperatures near the border dropped to –23 C but felt more like –33 with wind chill. His gloves, hat and jacket weren't warm enough. Kouevi ducked into a shed in Emerson, the small Manitoba border town that has become an asylum-seeker hotspot, to escape the wind before he called RCMP for help on his cellphone. "I tried to hide. The wind was blowing on my face. I could not handle the cold," he said in French, which a Radio-Canada reporter translated into English. "I tried to stop cars, but nobody would help me. I went to a house, but nobody was there." Kouevi was a butcher and handyman back home. 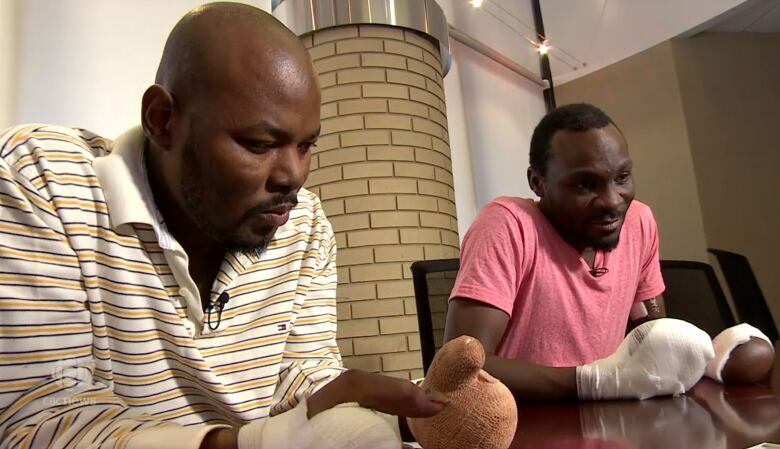 He doesn't know what he will do if doctors decide to amputate his fingers, like they were forced to with asylum seekers Razak Iyal and Seidu Mohammed early last year. Though few have suffered such severe injuries trying to cross the border, hundreds have made the risky trek through snowy Prairie fields in recent years. 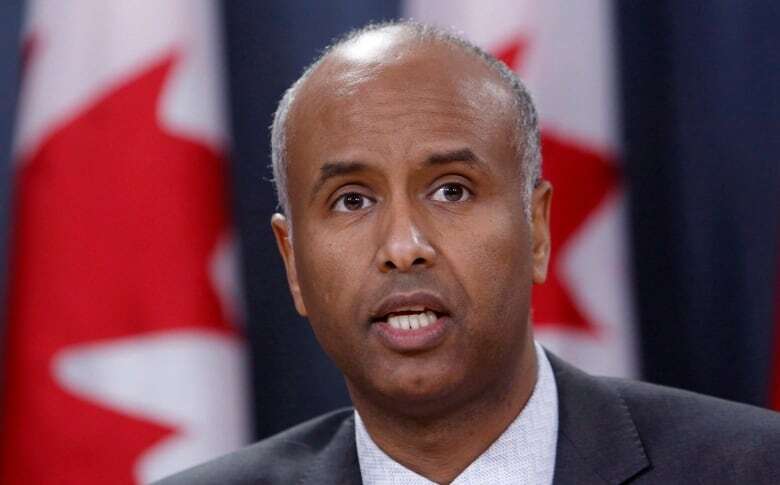 Immigration Minister Ahmed Hussen said Tuesday the number of asylum seekers being intercepted at the Manitoba-U.S. border port in Emerson is "extremely low" right now. Emerson Reeve Greg Janzen fears that could change, in part, due to President Donald Trump's pledge to suspend the temporary protected status of 200,000 Salvadoran immigrants in the U.S. The group was originally granted temporary protection status in 2001 after two earthquakes left hundreds of thousands homeless in El Salvador. Those in the U.S. have, until recently, been permitted to work and live in the country but the Trump administration is lifting their protection status as of September 2019, forcing those from El Salvador to leave or file for legal residency before then. "That's the concerning part — are they going to head through Emerson?" Janzen said, adding the town has more resources and is generally more prepared than it was last year during winter asylum-seeker spikes. 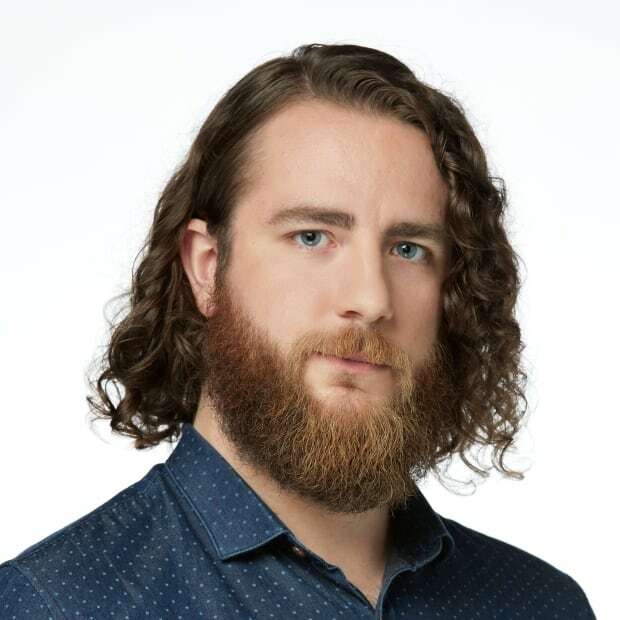 Canada Border Services Agency's most recent public data suggests RCMP intercepted almost as many people at the Manitoba border late in 2017 as they did in 2016. A total of 67 and 38 people were picked up in October and November 2017 respectively, down from 66 during each of those months in 2016. Just under 1,000 asylum seekers crossed into Manitoba between January and November of last year; at least 435 crossed in 2016. Members of Parliament have been sent to Los Angeles, Dallas, Houston, New York and Miami in recent months to clarify misinformation about Canada's immigration laws. Hussen visited Minnesota last month to speak with state Gov. Mark Dayton and dispel myths about crossing into Canada for immigrant communities in that state. It is suspected that many asylum seekers, including those with connections to the Minneapolis Somali community, have travelled from Minnesota at some point on their journeys to Manitoba. "I went to Minnesota to engage with those communities to make sure that we are still being proactive, we're not taking anything for granted," Hussen said Tuesday. "And to also inform them that coming to Canada is not a free ticket, that we have laws in place, and to discourage irregular migration, to tell them that is an illegal act, that it is potentially dangerous." Janzen said he appreciates Hussen's message and says it may deter some from eyeing the Manitoba border, though he doesn't really know if it will make a difference. Janzen also doubts much will change unless Canada pulls out of the Safe Third Country agreement, a pact with the U.S. that legally requires asylum seekers to file for refugee status in the first "safe" country they arrive in. Groups ask Federal Court to strike down Safe Third Country deal with the U.S.
"Other than closing that loophole that's about all he can do," Janzen said. "I don't know of anything else that can be done … to slow the flow down, really, of people jumping across the border." The agreement requires border officials to turn away any prospective refugee claimants who try to cross at official U.S.-Canada customs ports. But if they cross through a field and evade detection, a United Nations declaration overrides the Safe Third Country Agreement. In such cases, the declaration protects those people from immediate deportation and allows them to file for refugee status in Canada. Karin Gordon is helping Kouevi settle and secure health and immigration documentation so he can take steps toward filing for refugee status. 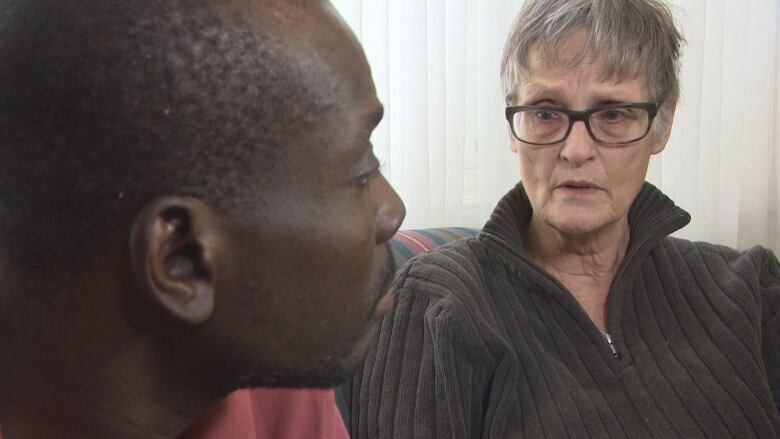 Gordon took the asylum seeker in Saturday after he was treated at Winnipeg's Health Sciences Centre. "He had been up for about 48 hours he was in shock," said Gordon, executive director of settlement for Hospitality House Refugee Ministry. Gordon is helping Kouevi change his dressings and with just about everything else due to his bandaged hands, something she gained experience doing when she cared for Razak Iyal and Seidu Mohammed, who suffered severe frostbite when they walked across the border on Christmas Eve in 2016. "I'm used to this drill," she said. "My whole goal here in terms of settling people is to make them become independent." She said Kouevi is currently awaiting more checkups from doctors and possibly a referral to a specialist. He'll soon have a home-care nurse coming to change his dressings, Gordon added. It's not yet clear whether Kouevi will need to have some or all of his fingers removed due to frostbite. "I am scared something [will] happen to my hands," Kouevi said in French. "My hands are my freedom."